No vacation to Australia is complete without seeing the incomparable Great Barrier Reef. On this Australia tour, you’ll take a catamaran cruise to the Outer Great Barrier Reef and have the chance to snorkel, take a semi-submersible watercraft tour, or attend a presentation by a marine biologist. With the radiant colors and fish swimming by you, it is nothing short of spectacular! But that’s not all. 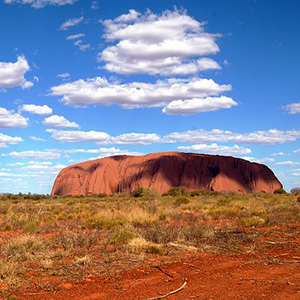 You’ll also witness the spectacular geological wonders of Uluru (Ayers Rock), the iconic monolith and symbol of the Outback, and Kata Tjuta (the Olgas), with its red rocks and 36 brilliant domes. Tour the base of Uluru with its caves and Aboriginal paintings, and enjoy a champagne toast while watching Uluru change colors at sunset-an amazing sight indeed!